Why are my child’s baby teeth changing colour? The colour of normal healthy teeth varies and depends on many factors including genetics. If your child’s teeth start changing colour, it is advisable to see your dentist for a proper course of action. Some of the following things could be the culprit for tooth discolouration. Supplements or medications – iron is the most commonly used supplement/medication that causes staining. The teeth start developing a black-brown stain which can be removed by the dentist. Please consult with your paediatrician before giving your child supplements. Other medications that can cause staining are those that contain iodine, sulfides, silver nitrate, manganese, copper or nickel. These can cause stains that can range from grey to yellow to green to brown to black. 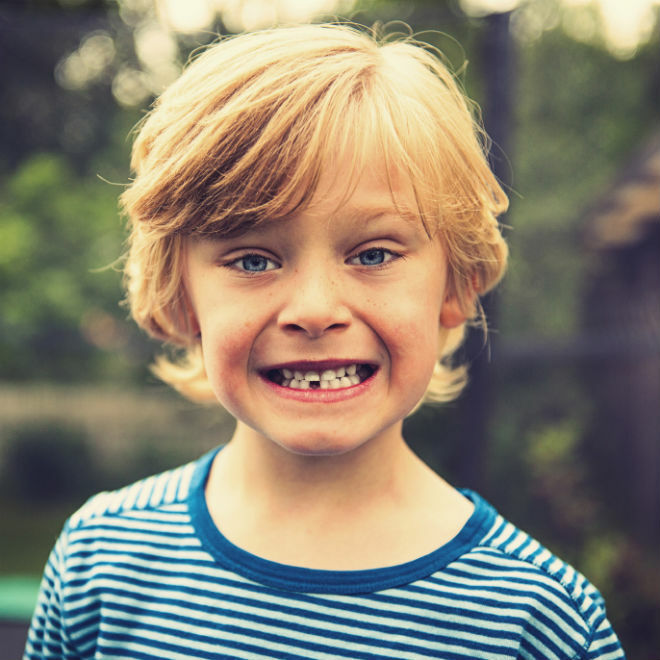 Injury – when your child injures a tooth, one of the possible consequences is a change in the colour of the tooth. Immediately after injury, the tooth may appear reddish-blue because of the effect on the pulp of the tooth. It is important to see your dentist soon after injury for proper evaluation of your child. Over time, the injured tooth may become yellow or grey-black. This discolouration may be temporary or permanent until the baby tooth falls out. Tooth decay – tooth decay can present itself as very white, yellow or black. It is often accompanied by break down of the tooth. It is recommended to visit a dentist by age one and regularly thereafter, so as to stay on a good preventive plan for your child. Food – certain foods especially those with a lot of chlorophyll (green vegetables) tend to cause staining, frequently on children who have poor oral hygiene. Why are my child’s teeth crumbling? Normal healthy teeth have a hard outer layer (enamel). It is important to maintain the health of teeth through proper preventive measures as determined by regular visits to the dentist. There are many reasons why teeth may crumble but the two most common causes are tooth decay and poor tooth development. Tooth decay – in this case, the teeth will grow into the mouth healthy and then start to crumble because of poor oral hygiene and a diet rich in sugars. Falling asleep with milk in a baby bottle or nursing in the middle of the night can also cause tooth decay. Poor tooth development can be due to a number of factors ranging from genetics to interference in tooth development during pregnancy or early childhood. In this case, the teeth will grow into the mouth discoloured or disfigured, and sometimes it is accompanied by sensitivity. A visit to your dentist in Fresno CA will result in a proper diagnosis and course of action.